Coconut Leche Flan is the ultimate flan recipe for coconut lovers! 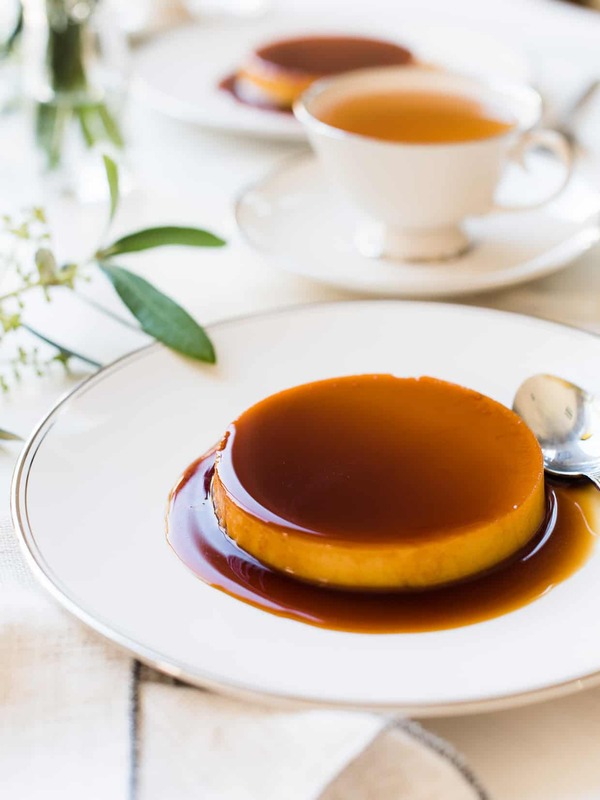 This Filipino-style flan is custardy, sweet, blends silky creme caramel with coconut, and is topped with macapuno for that extra tropical twist. Coconut Leche Flan is the ultimate flan recipe for coconut lovers. This recipe for Filipino-style coconut flan is from My Mother’s Philippine Recipes: Filipino Cookbook Recipes from Asian in America by Elizabeth Ann Besa-Quirino. I often am asked, “what is your most treasured kitchen item?” Of all the tools, gadgets, baking dishes and appliances stuffed in my cabinets and drawers, there is one thing that matters more to me than anything else, and that is a simple, black folder, bursting at the seams with my mom’s handwritten recipes. Some recipes are neatly written, on index cards, where she clearly had the intent of making sure it was preserved perfectly, perhaps with us kids in mind. Some are scribbled on wrinkled sheets of scrap paper, most likely hurried notes that she jotted down as she watched her favorite cooking shows. Some are in letter form, to sisters, cousins, and aunts, mixed in with mundane stories of life in New York. I have them all, stuffed into this folder, and cooking from them brings me back to her, especially on those days when I miss her more than usual. We all have memories, and I know I’m not alone in treasuring the food memories that tie us together as a family. I felt this when I hugged my friend Betty-Ann a few months ago, at an IACP conference in New York, as she proudly handed me a copy of her cookbook. 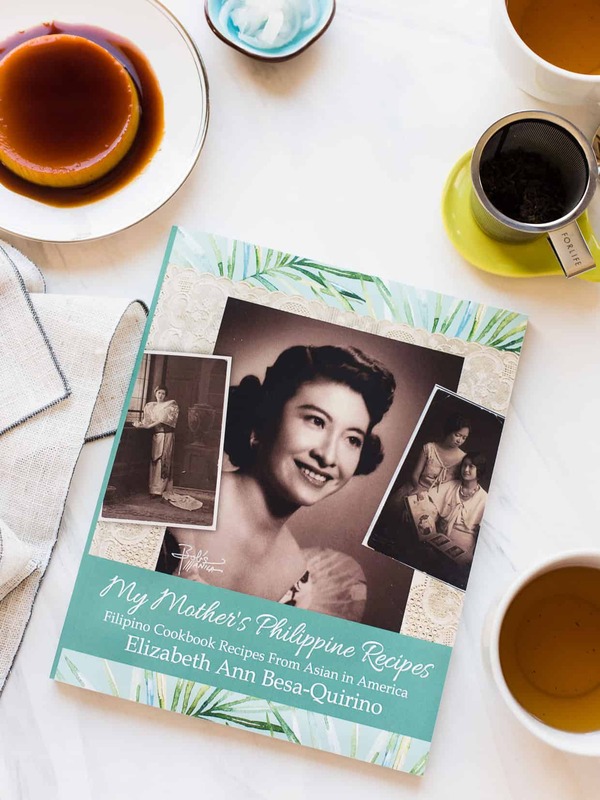 My Mother’s Philippine Recipes: Filipino Cookbook Recipes from Asian in America is Elizabeth Ann Besa-Quirino’s beautiful version of my black folder — a work of love and a touching tribute to her mother and the recipes she treasures. 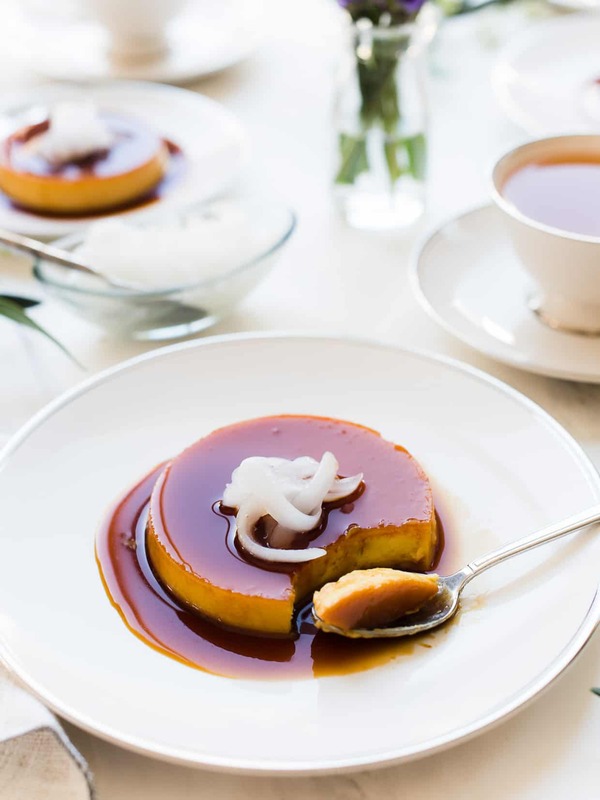 When she asked me if I would like to share a recipe from her book with you for Mother’s Day, I was honored to cook from her book and flipped through the pages of beloved Filipino recipes before I decided to share with you her Coconut Leche Flan. Why a flan, when I’ve already shared my own classic leche flan and pumpkin twist before? Well, it’s Mother’s Day weekend, so something sweet is in order, and also because I was drawn to the coconut twist to a classic flan. Betty-Ann uses both coconut milk and coconut cream in her coconut leche flan, which I knew my coconut loving family would adore, and on top, to give it even more decadence, are strings of macapuno. If you have one minute, I would describe it as sweet strings of shredded coconut, but that’s not the whole story. Macapuno, also known as “coconut sport,” is actually a genetic mutation of the coconut tree, where the coconut has an abnormal development of the endosperm. While it looks like a regular coconut on the outside, the fruit on the inside is soft, jelly-like, and gelatinous. Shredded macapuno strings are preserved in a heavy sugar syrup, and used in sweet desserts in the Philippines. I should note that some macapuno that is sold is actually made of young coconut, which can mimic macapuno, but genuine macapuno is quite different. You can find macapuno in most Asian markets, or also on Amazon. One of the beautiful things about leche flan is that because you make it in advance, it makes it the perfect dessert for entertaining. Betty-Ann makes her Coconut Leche Flan as one large flan, to be sliced and served, but you can also make it in individual portions, as I have here. If you can’t find macapuno, do not worry, make the coconut flan anyway. It is still wonderful without the garnish, and quite decadent on its own. Disclosure: There are affiliate links in this post. For more information, visit my Privacy page. Coconut Leche Flan is the ultimate flan recipe for coconut lovers. 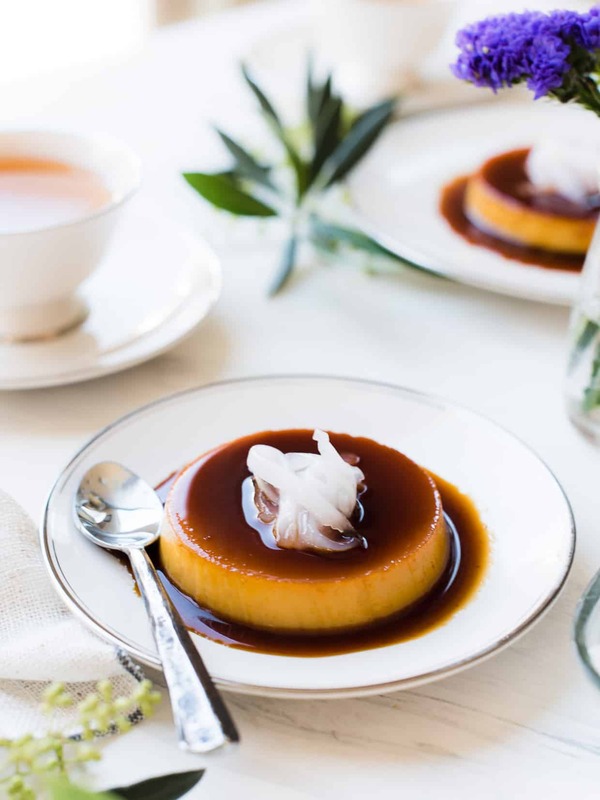 This Filipino-style flan is custardy, sweet, and blends silky creme caramel with coconut, and is topped with young coconut for that extra tropical twist. Easy, elegant and perfect for entertaining! Preheat the oven to 325°F with a rack in the center of the oven. Prepare your baking dish(es). This can be done in a 9x5 inch loaf pan, a 9 inch round cake pan, or 6 individual 6-ounce ramekins. Place these in a kitchen towel-lined roasting pan. Pour the sugar into a heavy saucepan set over medium heat. Tilt the saucepan every so often as the sugar turns amber and transforms into a thick, syrupy mixture, about 5 minutes. Do not stir. As the sugar begins to bubble from the edges, moving to the center, reduce the heat to medium-low, keeping a careful eye, as the sugar can easily burn. Once the sugar has fully transformed into a sugary syrup, carefully pour the hot caramel into your prepared baking dish(es), tilting gently to evenly coat the bottoms. Set aside as you prepare the custard. In a large mixing bowl, whisk the egg yolks until well blended. Pour the condensed milk, coconut milk, coconut cream and vanilla into the egg yolks, and blend well with a wooden spoon until smooth. Strain the mixture into a large measuring cup. Pour the custard into the baking dish(es). Carefully transfer the roasting pan into the oven, and pour very hot tap water into the pan up to halfway up the sides of the baking dish(es). Bake for 45-50 minutes, or until the flan is set. Cool the flan for 10 minutes while still in the roasting pan, then transfer to a wire rack or towel-lined counter to cool for another 50 minutes. Cover and refrigerate the flan overnight in the refrigerator. When ready to serve, run a sharp knife or offset spatula around the edges of the baking dish(es), dip the dish in a bowl of hot water to help loosen the flan, and invert onto a serving dish. Garnish with macapuno strings and serve. If you can't find macapuno, do not worry. I encourage you to make the coconut leche flan anyway and serve without the garnish! It's still delicious. The coconut cream definitely adds to the richness of this dessert. If you wish to lighten it up, substitute the coconut cream for more coconut milk. If you want to lighten the flan even more, I would suggest substituting the 10 egg yolks with 8 egg yolks and 2 whole eggs. Recipe reprinted with permission from My Mother's Recipes: Filipino Cookbook Recipes from Asian in America by Elizabeth Ann Besa-Quirino (Besa-Quirino, LLC, 2017). 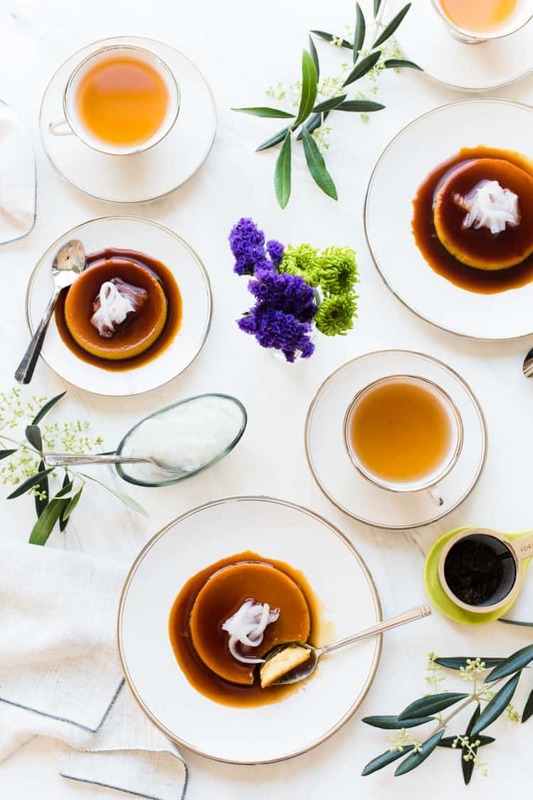 so many interesting elements to this recipe, I’d never heard of Macapuno, so that’s one thing among others, also love the photographs, beautiful, the set flan reminds me of an infinity pool! Thank you for this recipe! Thank you for sharing the recipe! The flan is amazing! I tried to make flan once but it failed in pain (an afternoon to wash the burned pot). Can’t wait to try this coconut leche flan. Thanks again for sharing your lovely version of my mom’s Coconut Leche Flan from my cookbook. I am honored and will treasure this post always, Liren!